Nic Stone is the author of Dear Martin (Crown Books for Young Readers), a Summer/Fall 2017 Indies Introduce selection for young adults and an Autumn 2017 Kids’ Indie Next List pick. 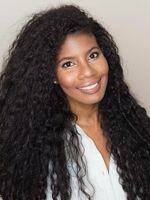 Stone received her bachelor’s degree in psychology from Atlanta’s Spelman College and went on to work as a teen mentor and live in Israel. She currently writes full-time and lives with her husband and two sons in Atlanta, where she grew up. Annie Farrell of Labyrinth Books in Princeton, New Jersey, was a member of the panel that selected Dear Martin for the Indies Introduce program. Here, Farrell and Stone discuss the author’s debut, which tells the story of Justyce McAllister, an African American teenager at the top of his prep-school class who is straddling two worlds in the midst of increasing tension and violence between police and his community. Annie Farrell: There’s an urgency to Dear Martin that is impossible to look away from. Justyce’s story is not an easy one. What drew you to tell it? Nic Stone: The urgency in the book comes from the urgency I feel every day as the mother of two little black boys. The impetus for Dear Martin was the deaths of unarmed African American children — Trayvon Martin, Jordan Davis, Michael Brown, Tamir Rice, Jordan Edwards — at the hands of people who are grown and should know better. I was also frustrated by the (mis)use of the words of Dr. Martin Luther King Jr. to oppose exactly the type of nonviolent protests he championed. These things taken together stirred up a question for me: What would Dr. King do if he were alive to witness these tragedies? Would his teachings and philosophies hold up now? What would he say about 21st-century American race relations? Dear Martin exists as a record of my search for answers to these questions, largely because I needed to get a better handle on the world in which I’m raising these boys, who could one day be perceived as threats before they’re seen as children. AF: By making SJ and Justyce classmates as well as debate partners, you’ve given your characters a way to introduce readers to information and arguments that might be new to them. Did you have a reader in mind as you put the book together? What do you most want people to take away from it? NS: I was thinking of my older son when I wrote this book. He was two and a half then and is only five now, but I’m big on teaching my kids to ask questions, think critically, and be self-aware. That is what I want people to take away from the book: It’s a good thing to be self-reflective and to examine your own thought processes and be honest with yourself about your biases (because we all have them). It’s a good thing to be curious about — skeptical of, even — the world you live in and how it functions. It’s a good thing to ask tough questions and put a spotlight on macro-level problems, even when there really are no clear-cut answers or simple solutions. People who actually think are the ones who have the power to make the world better. AF: One of the things that makes Justyce such a compelling character is the way that he navigates two very different worlds while feeling he doesn’t fully belong in either. What advice would you give to the many kids who deal with that in their own lives? NS: There’s a point where Justyce tries to run away from his lush private school (where he lives during the school year) back home to his mama’s house in “the hood” because he’s tired of feeling other. Mama — before sending him right on back to school — tells him something to the effect of people who make history rarely fit in. And it’s the truth. Look at Einstein or Ruth Bader Ginsburg. Look at Dr. King, even. And me! I certainly never fit anywhere, and now, here I am, an ABA Indies Introduce author! On a serious note, though, for the kids who don’t fit: enjoy the freedom. It can definitely get lonely at times, and I’m not discounting that, but there’s a lot of power in nonconformity. Being able to see the world without the lens of a social group you have to agree with in order to stay a part of — well, that’s kind of a gift. Enjoy it. AF: You’ve written beautifully about the difficulty of seeing police violence against people of color, especially given that your father was a police officer. Can you talk about what it was like to write the police officer characters in Dear Martin? NS: A fun fact: Dear Martin used to be way longer and had multiple points of view, including that of the police officer whom Justyce and his best friend have a run-in with in the middle of the book (deliberate vagueness alert). Having a dad who spent almost every day of the first 24 years of my existence in a uniform gave me some insight into the humanity — and, therefore, the fallibility — of cops. But it took talking to my dad about his experiences and slipping inside that officer’s head by writing his point of view to get me past some of the fury sizzling in my veins so it wouldn’t show up on the page. We wound up cutting that perspective (as well as all the others) because we decided to focus solely on Justyce and his experiences, but who knows, maybe some of the deleted scenes will be released as bonus material at some point! AF: Can you tell us what’s next for you? NS: Mum’s the word on details (all shall be made known in time! ), but what I can say is that my next book — another contemporary YA that we’ll call Triple O for now — deals with a different marginalized aspect of my identity. Triple O is the book I needed as a teen, when I was trying to figure out who it was okay to love. Look for it next fall! 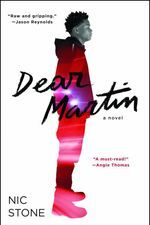 Dear Martin by Nic Stone (Crown Books for Young Readers, HC Young Adult, $17.99, 9781101939499) On Sale Date: 10/17/2017. Learn more about the author at nicstone.info.